Put your garden in a happy mood! 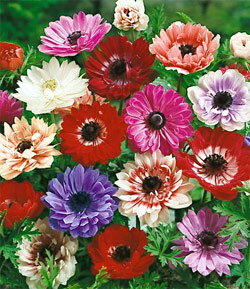 Anemone St. Brigid produces plentiful daisy-form flowers in candy colors—whites, reds, blues, and pinks. Grows 8-10 inches tall and each plant producing 3 to 5 flowers. A delightful addition to shady rock gardens or borders, or in mixed beds with other late-spring flowers. Wonderful for cutting, too. *Please soak bulbs in lukewarm water for a few hours prior to planting to wake them up.